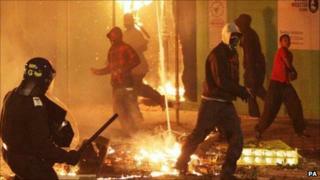 England riots: The feast of fools? Kenneth Clarke's analysis of last month's riots in England amounts to a neat justification of coalition social policy in general and the Ministry of Justice's "rehabilitation revolution" in particular. In focusing on the previous criminality of the majority of adults charged in connection with the unrest he is able to conclude that we have "a broken penal system - one whose record in preventing reoffending has been straightforwardly dreadful". Mr Clarke's solution, therefore, is not simply locking people up, a philosophy of punishment that enjoys support with some on the Conservative right, but a system of "intelligent sentencing" which also makes it less likely an offender will commit further crimes. This has been Mr Clarke's argument since he took office last year and his article in today's Guardian cleverly uses the rioting to justify his position. But the justice secretary also strays into the realms of sociological analysis, trying to understand why England saw outbreaks of looting and arson flare up apparently without real cause. His use of phrases such as "feral underclass" and "criminal classes" to describe those involved in the riots plays to a long-standing view of a law-abiding majority in Britain which falls prey to a distinct and dangerous minority, an impoverished and malevolent mob feeding on the righteous. This idea of a "them and us" divide may be popular, but it is contested. In 1997, two sociologists at Bristol University, David Gordon and Christina Pantazis, looked for evidence of an "underclass" blighted by some pathological culture of poverty. They went back to the Pauper Pedigree Project of the Eugenics Society, which ran from 1910 to 1933. They scoured the pages of the Problem Families Project of 1947. They looked at the multi-million-pound government funded Transmitted Deprivation Programme of the 1970s. Their conclusion: "Despite 150 years of scientific investigation, often by extremely partisan investigators, not a single study has ever found any large group of people/households with any behaviours that could be ascribed to a culture or genetics of poverty." Whether the criminal "underclass" is an identifiable and stable group may be questionable, but BBC analysis of people charged in relation to the disorder in Manchester does suggest a clear correlation with deprivation. We looked at the details of 197 people who were charged with riot-related offences at Manchester City Magistrates Court up until 23 August - amounting, we believe, to the vast majority of those individuals prosecuted. Of that 197, we obtained postcodes for 153 people and have plotted their home addresses against a map showing the deprivation of local neighbourhoods. According to analysts at Manchester University, "the evidence supports a clear association between deprivation and the likelihood of being involved in the criminally riotous behaviour". The experts from the Cathie Marsh Centre for Census and Survey Research noted that while "some people are charged from areas of every level of deprivation... most are charged from areas of higher deprivation, with over a third (36.1%) of all those charged in the tenth most deprived areas." This table provides a clear picture: the numbers charged in each neighbourhood increases with deprivation, two people from the richest 10% of Greater Manchester and 53 from the poorest 10%. It doesn't mean poverty caused the crime, of course, but there is something about being poor that makes it more likely an individual became involved. The data also suggest those characterising the riots in Manchester as the work of juvenile gangs are mistaken. The average age of those charged in the city is 24, the youngest 12 and the oldest 58. Only one in ten of those charged were under the age of 16. There is some anecdotal evidence that the rioting in Tottenham and Hackney may have had a greater link with local gangs, but the age profile of those charged in Manchester suggests the copy-cat disturbances were driven by something else. Ken Clarke today draws a tentative link between the riots and social exclusion. "The general recipe for a productive member of society is no secret," he suggests. "It's about having a job, a strong family, a decent education and, beneath it all, an attitude that shares in the values of mainstream society." In this regard, he writes, there may be lessons to be learned from the riots. Certainly, the areas in Manchester from which the majority of the rioters come are places without many of the ingredients required for a "productive member of society". I have spent part of the day in Cheetham Hill, a district with a relatively high concentration of people charged and high levels of unemployment, educational underachievement, crime and poverty. Trying to explain the rioting, the local vicar Daniel Burton told me: "it was as though the normal rules had been suspended for one night only." His parish is filled with people who feel excluded from the mainstream, he told me, disempowered and bitter. The sight of conventional authority in retreat in other urban areas encouraged them to believe that they had a brief opportunity to challenge the traditional power structures. This idea fits with the impression I got listening to masked rioters on the BBC in the days immediate after the disturbances in Manchester. Muffled voices from behind scarves and balaclavas talked of the exhilaration and excitement they felt, a sense that they were omnipotent in a world where they normally feel downtrodden. Some looted to get fancy trainers but many others did it simply because they could. I wonder whether this is the key to understanding what went on in those crazy August days. The riots of 2011 perhaps had their roots in the ancient feast of Saturnalia, when, for a few days slave supposedly became master and master slave. The Lord of Misrule was walking the streets of urban England, encouraging those without power to behave as though they had. It was a feast of fools.